"The hippocampus is a major component of the brains of humans and other mammals. It belongs to the limbic system and plays important roles in the consolidation of information from short-term memory to long-term memory and spatial navigation." "Damage to the hippocampus does not affect some types of memory, such as the ability to learn new motor or cognitive skills (playing a musical instrument, or solving certain types of puzzles, for example)." "The hippocampus contains high levels of glucocorticoid receptors, which make it more vulnerable to long-term stress than most other brain areas. Stress-related steroids affect the hippocampus in at least three ways: first, by reducing the excitability of some hippocampal neurons; second, by inhibiting the genesis of new neurons in the dentate gyrus; third, by causing atrophy of dendrites in pyramidal cells of the CA3 region. There is evidence that humans who have experienced severe, long-lasting traumatic stress, show atrophy of the hippocampus, more than of other parts of the brain. These effects show up in post-traumatic stress disorder, and they may contribute to the hippocampal atrophy reported in schizophrenia and severe depression." "The hippocampus has a generally similar appearance across the range of mammal species, from monotremes such as the echidna to primates such as humans. ."
"Non-mammalian species do not have a brain structure that looks like the mammalian hippocampus, but they have one that is considered homologous to it. The hippocampus, as pointed out above, is essentially the medial edge of the cortex. Only mammals have a fully developed cortex, but the structure it evolved from, called the pallium, is present in all vertebrates, even the most primitive ones such as the lamprey or hagfish. The pallium is usually divided into three zones: medial, lateral, and dorsal. The medial pallium forms the precursor of the hippocampus. It does not resemble the hippocampus visually, because the layers are not warped into an S shape or enwrapped by the dentate gyrus, but the homology is indicated by strong chemical and functional affinities. There is now evidence that these hippocampal-like structures are involved in spatial cognition in birds, reptiles, and fish. ."
"Several types of fish (particularly goldfish) have been shown experimentally to have strong spatial memory abilities, even forming "cognitive maps" of the areas they inhabit. There is evidence that damage to the lateral pallium impairs spatial memory. Thus, the role of the hippocampal region in navigation appears to begin far back in vertebrate evolution, predating splits that occurred hundreds of millions of years ago. " In the course of a day, there are many times when you need to keep some piece of information in your head for just a few seconds. Maybe it is a number that you are “carrying over” to do a subtraction, or a persuasive argument that you are going to make as soon as the other person finishes talking. Either way, you are using your short-term memory. This ability to hold on to a piece of information temporarily in order to complete a task is specifically human. It causes certain regions of the brain to become very active, in particular the pre-frontal lobe. This region, at the very front of the brain, is highly developed in humans. It is the reason that we have such high, upright foreheads, compared with the receding foreheads of our cousins the apes. Hence it is no surprise that the part of the brain that seems most active during one of the most human of activities is located precisely in this prefrontal region that is well developed only in human beings. Human memory is a complex phenomenon, however, and of course involves other regions of the brain as well. 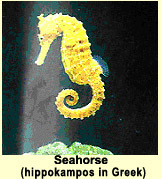 Information is transferred from short-term memory (also known as working memory) to long-term memory through the hippocampus, so named because its shape resembles the curved tail of a seahorse (hippokampos in Greek). The hippocampus is a very old part of the cortex, evolutionarily, and is located in the inner fold of the temporal lobe. All of the pieces of information decoded in the various sensory areas of the cortex converge in the hippocampus, which then sends them back where they came from. The hippocampus is a bit like a sorting centre where these new sensations are compared with previously recorded ones. The hippocampus also creates associations among an object’s various properties. When we remember new facts by repeating them or by employing various mnemonic devices, we are actually passing them through the hippocampus several times. The hippocampus keeps strengthening the associations among these new elements until, after a while, it no longer needs to do so. The cortex will have learned to associate these various properties itself to reconstruct what we call a memory. But the hippocampus and the cortex are not the only structures involved in long-term memory and its various manifestations in the brain. This is only the Beginner-Neurological Level. Click on the link. On the left side of the page there are links for Intermediate and Advanced, and on the right side of the page there are links for Social, Psychological, Cellular and Molecular. Each link leads to a different page covering the same topic from a different perspective.